Andy Pye looks at what a German university is plotting in order to counter deliberate EMC attacks on electronic equipment. It sounds like science fiction –  in Ocean‘s Eleven, George Clooney’s gang disables the Las Vegas power grid, and Keanu Reeves’ henchmen hold off the enemy robot fighters from their spaceship in the Matrix trilogy. The heroes in these films succeed by sending out a very strong electromagnetic pulse. This changes the voltage in the vicinity so that electronic equipment goes crazy. Those affected by it do not know why computers or machines break down or from which direction the attack comes. Today, organisations are dealing with extremely organised and sophisticated foes. One big Wall Street Bank, JPMorgan Chase, is spending $250 million dollars a year to combat this growing problem. Among the potential threats is indeed the electromagnetic pulse weapon. The technology can fit inside a briefcase. “What works on the silver screen is also conceivable in reality,” confirms Michael Jöster from the Fraunhofer Institute for Technological Trend Analysis INT. “The threat scenarios are real: criminals can cause confusion to bypass monitoring points and alarm systems, enabling secure areas to be penetrated. While the technology available to attackers has improved, that being attacked has become more vulnerable. Our infrastructure increasingly depends on closely integrated, high-speed electronic systems operating at low internal voltages. That means they can be laid low by short, sharp pulses high in voltage but low in energy. High-power microwave sources are suitable. A large electromagnetic weapon could be hidden in a small van with side panels made of fibreglass, which is transparent to EM radiation. If the van were parked about 5 to 10m from the target, the EM fields propagating to the wall of the building can be very high. If, as is usually the case, the walls are masonry without metal shielding, the fields will attenuate only slightly – if a mobile phone works well inside a building, then it is probably wide open to attack. Individual attacks have already been documented: thieves in Berlin exploited electromagnetic waves to crack the security systems of limousines. “Located In the right position, it is enough to press a button to trigger the pulse. Just like in Ocean’s Eleven or Matrix, the electronic systems nearby can fail or be damaged,” says Jöster. Another area where safety is important is automobiles. “The importance of electronic components will continue to increase in the future. Completely shielding individual devices from electromagnetic radiation would certainly be theoretically possible, though much too expensive. Systems are needed that can detect these kinds of attack. If you know what is attacking, you can also react correctly to it,” says Jöster. Now, a new measuring instrument can determine the strength, frequency, and direction of the attack. 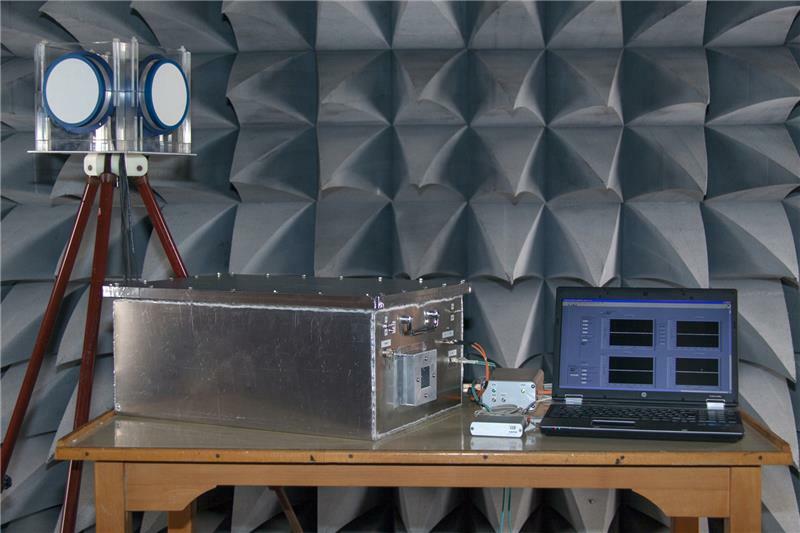 The Fraunhofer researchers have developed a measurement instrument that can determine the strength, frequency, and direction of electromagnetic attacks. The engineering requirements are steep: the detector must measure very high field strengths from very short pulses, yet not be destroyed or damaged itself. Four specialised antennas make up the INT demonstration instrument that sample the environment around the subject device to be protected. Each of these covers a quadrant of 90 degrees and detects all types of electromagnetic sources. A high-frequency module preconditions the signals for measurement and determines when the electromagnetic pulse started and stopped. A computer in a monitoring station connected via an optical conductor then calculates the values for the signal and presents them on a screen.